Merrie Christmas: Man with Christmas Goose, this Norman Rockwell painting, appeared on the cover of The Saturday Evening Post published December 10, 1932. The alternate title for this painting is just Christmas Goose. This painting was Rockwell's 142nd of 322 overall pictures featured on the cover of The Post. Rockwell's career with the Post spanned 47 years, from his first cover illustration, Boy With Baby Carriage in 1916 to his last, Portrait of John F. Kennedy, in 1963. This was also the third Rockwell cover in 1932. 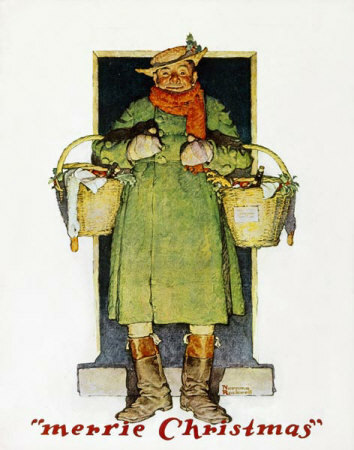 The Post featured a Rockwell illustration on its cover three times in 1932.
on page 123 of Norman Rockwell, A Definitive Catalogue by Laurie Norton Moffatt. This is another of the many paintings Norman Rockwell created based on the stories of Charles Dickens. Especially early in his career, Rockwell painted a lot of paintings showing a vintage and fictional theme. Items from Rockwell's extensive collection of period and vintage clothing and costumes are featured in this illustration. Of course, the jolly expression on the man's face overshadows the age and beauty of his vintage overcoat. Rockwell was very passionate about painting expressive faces. He considered having interesting and expressive facial features to be one of the top considerations for his models. At this point in time, Rockwell had not even begun experimenting with using photographs in his painting method. So the ability and willingness to maintain a pose motionlessly was also a top consideration for a model. Here we see a man leaving his home to go and visit his family on Christmas day. The only indication that this is a Christmas painting is the holly sprigs in his hat and on his baskets. Of course, there is always the caption at the bottom, "Merrie Christmas." We know he is leaving because we can see the stoop behind him. It is a shame that the card attached to the right basket is illegible. If we could read it, that would be another common name for the painting. Each basket sports, in addition to the holly sprigs, a goose and a bottle of wine each. It also appears that each basket carries apples as well. He brings something for the children as well as for the adults. With those two big baskets full almost to overbrimming, he is prepared for a real Christmas feast. He is all bundled up against the cold. Let's hope he doesn't have far to go. After all, it is Christmas.